This was just for fun… Simple ingredients, served in a fun way… it’s not really a recipe at all. feel free to exchange any food item out for one that your child likes. There are even fun “Fred & Friends Food Face Plates” that are ideal for serving a small amount of food in a fun way. Click here for the boy face and here for the girl face. PLEASE don’t laugh at my face building skills! I did the best I could!!! If these food items do not appeal to your child, change them to things they like. This is just to present the “idea” not an actual recipe. Hard boil eggs. When cooled, slice the eggs horizontally. Remove the yolks and weigh the whites. Mash the avocado until smooth. Blend the oil into the avocado until it is combined. Season with salt and pepper. Slice the olives and use as the center of the eyes. Chop the rest to add as “hair”. Weigh the ketchup or BBQ sauce in a syringe and decorate the plate with it. Use it as the center of the eyes and hair. I used the almond crackers as “teeth”. 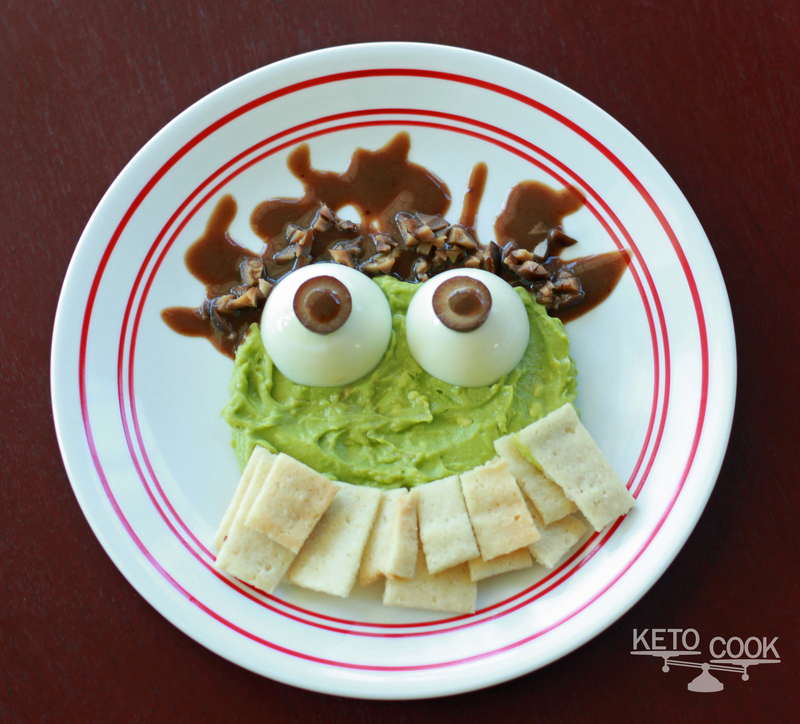 You can find the recipe in the keto calculator under Standard Snacks. Just to be completely honest… Charlotte did not want to touch this with a ten foot pole! Luckily, we are blessed to have “the human trash can” AKA, my 5 year old son! 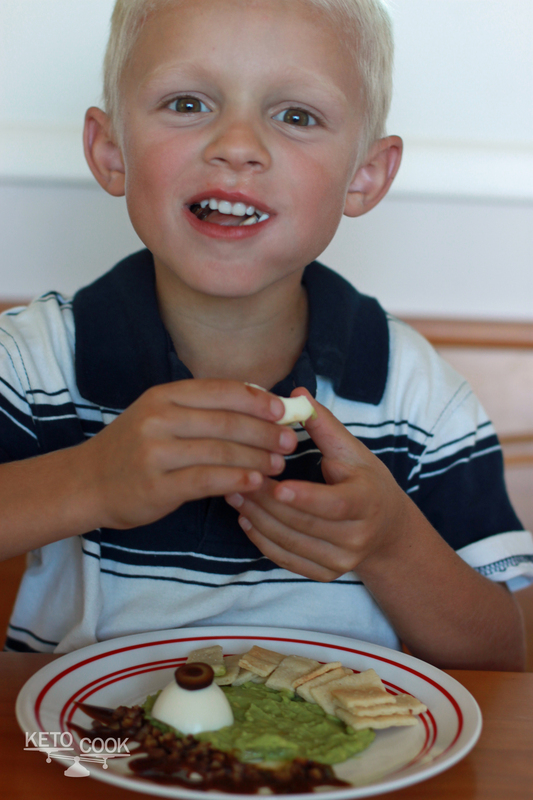 HE happily ate the entire plate, and he is not even a keto kid! Dawn, in Sydney we don’t use the ketocalculator, would you be able to write down the Almond cracker recipe? on ketocook? I know it is a bit boring, but lots of ketokids would really appreciate it I’m sure. Mine would! Ha! That is both hilarious and disgusting! I don’t blame Charlotte for not wanting to eat it. I’m curious about Nora’s reaction now, I’ll have to try it on her. And your son is adorable too! My son also eats everything that Nora eats. He is my unbiased taste tester. Yes, I think this appeals more to boys for some reason! Charlotte told me to never make it again when she saw this post!! !